A relative quickie done in response to a question about making hypno-eyes in DAZ. Thank you so much. 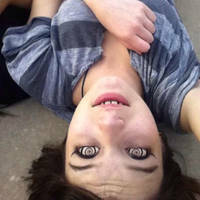 :cool: Awesome spiral eyes! Thank you so much. I will follow your recipe hopefully the result is similar to yours. Oooo how did you get those eyes? I use the DAZ Studio program instead of Poser. The free character model here, Genesis 2, includes a surface called "EyeReflection", which covers the whole eye (even the parts in the back of the head). You can create a spiral (or whatever) image with an external drawing program like Photoshop, GIMP or Paint Shop Pro and then tell DAZ to "paste" that image over the eyes' surface, instead of the glossy transparency (I guess) that's normally there. You will have to place two spirals side by side in your image, one for each eye, and add filler space around the edges/between them to get them positioned correctly; the way the 2D image wraps around the 2 separate 3D eyeballs is complicated. Note that not all model types have EyeReflection, and you may have to try something different if you don't have Genesis 2. Genesis 2 also lets you paste new surfaces over the figure's cornea and/or iris, if you don't want to change the whole eye. Going this route also lets you save off a copy of the 2D image that is used to generate the figure's original head/eyes, and directly manipulate it how you want; much simpler than the process above. Ooo I do Poser, but I will see if you can do the same there. Or a reasonable facsimile thereof!